In the same way as Pa Ubu, after having taken over the throne of Poland (which is Nowhere, as Jarry wrote) and having been fired from it, took some rest in “a cave in Lithuania”, it is to be hoped that ‘Pataphysics will find in Vilnius the best ground to “light a fire while other knaves bring the wood”. Be this fire lit by the flame of the Green Candle and the cave illuminated as the Institute of Science. We are happy to invite you to the opening of Vilnius’ Pataphysics Institute in Paneriai tunnel, and also to celebrate the occasion of the 65th anniversary of College de Pataphysique. Thieri Foulc (Proveditore Generale du Colledge de ‘Pataphysique, Paris) and Barbara Parcarel (London Institute of Pataphysics, Department of Potassons) will be present during the opening. A pata-picnic will take place after the official opening. The event will take place in Paneriai tunnel. The train from Vilnius train station (direction Vilnius—Kaunas) leaves at 2.45 pm and the journey to Paneriai lasts 10 min. 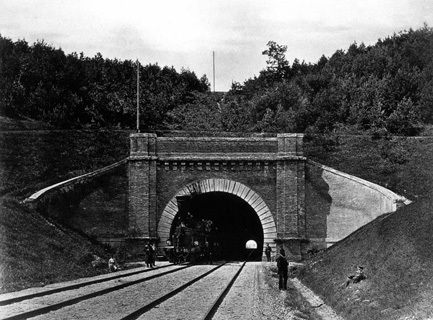 The tunnel is situated 500m west along the rail. Planned return time to Vilnius from Paneriai train station is at 7:22 pm although there are trains back every hour. An event is initiated by Robertas Narkus and open to public.